We received an invitation to dinner yesterday afternoon. One of our dependable auto shippers was coming through the area. The relationships we have built over the years have resulted in some close knit friendships. After a long day in the office it is always a welcome treat to meet up with our friends. A hot meal and some fun association is a great way to end the day. As we were driving south on the interstate we saw many other dependable auto shippers with full loads. Each truck and trailer set up is unique. I check out each unit for the chance to learn by seeing it first hand. I don't know about you, but I am a visual person. You can tell me all day long specific dimensions and configurations and I still won't get it. But, show me the real deal, walk with me around the trailer and explain as we go…and the aha moment arrives quickly. As we pulled into the truck stop I happened to notice the signage on all four corners. 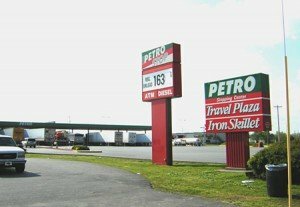 There are four different companies with restaurants, gift shops and fuel stations all located within yards of each other competing for the trucks business. Each brand advertised a different price, all within pennies of each other. Have you ever wondered how they set themselves apart from the competition? 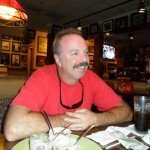 My husband and I have shared many a meal with several of our dependable auto shippers. Each driver has his favorite place to fuel up, dine at and take advantage of the amenities. We've never had the occasion to shower or fuel up at a truck stop so we can only make a choice based on our dining experiences. The friend we met last night, Eric invited us to the Petro Service Plaza to eat at the Iron Skillet. Before this location became a truck stop the restaurant was a local favorite known for it's home cooked meals. The service is warm and inviting and the food is good and hot. The waitresses are very attentive and keep your drink refills coming. There is no shortage on food choices either. You can order off the menu or choose the buffet special. My choice is always the soup and salad bar, delicious. It is so funny because each time we meet for a meal we always agree – NO shop talk. My husband hears about it all day long and the drivers live it all day long. The problem is, have you ever tried to dine with someone you work closely with and NOT talk shop? It really seems impossible sometimes. Last night's meal was special. We met another one of our dependable auto shippers, he is from New Zealand. We had talked with Mickey over the phone several times, but had never had the pleasure to meet face to face. I just love meeting new people, especially when I already feel like I've known them for a long time. Our conversation was a mixture of their experiences picking up and delivering cars, highway patrol stories and of course, New Zealand and the recent earthquake. Both Eric and Mickey had lived in Christchurch years back and were saddened by the recent event. Eric has a picture of himself standing in front of the cathedral that is now a pile of rubble. They both told stories of many an adventure in the town and country as a whole. Sitting in the booth after we finished our meal the stories flowed like a river. Then it was my turn to get a few words in by asking a few questions of my own. I asked why both of them became owners of their own business. The answers were similar to my own. Both of them wanted the freedom to be their own boss. They wanted the opportunity to earn unlimited income on their own terms. One point both guys made was kind of comical, but oh so true. They love the view from their office window! I got to share my vision for the growth of my company with them, too. They are both excited to watch as our auto transport broker coaching program rolls out in a few weeks. They are hopeful that our actions to educate brokers will help their business. By having supportive business partners who have each others back, we all can build profitable nationwide auto transport businesses. With full bellies and exhaustion setting in we decided to call it a night. After thanking our waitresses and paying the bill, we hugged, shook hands and parted ways. Turning back before hitting the door, I shouted "drive safe, we want to have dinner next trip".